Heat oven to 375°F. In large bowl, combine cake mix, oil and eggs; stir with spoon until thoroughly moistened. Shape dough into 1-inch balls; place 2 inches apart on ungreased cookie sheets. With bottom of glass dipped in flour, flatten to 1/4-inch thickness. Bake at 375°F. for 6 to 8 minutes or until edges are light golden brown. Cool 1 minute; remove from cookie sheets. 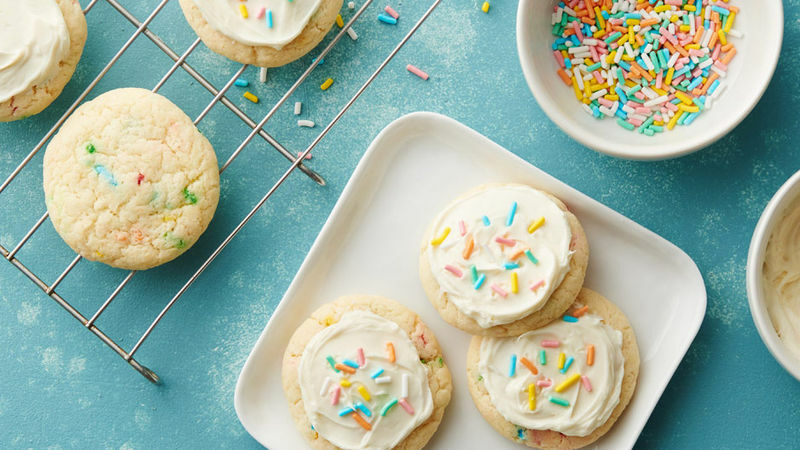 Spread frosting over warm cookies. Immediately sprinkle with candy decors. Let frosting set before storing. Store in tightly covered container.